Previous drowsiness prediction systems that rely on physiological data require the subject to attach electrodes or other hardware to his or her body. And since these systems tend to be bulky, they have not seen widespread use in automobiles. 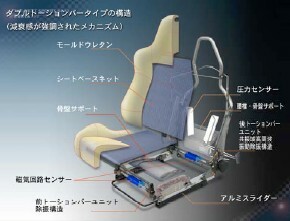 However, unlike previous systems, this newly developed smart car seat does not require the driver to wear any special hardware -- it can detect drowsiness as long as the driver remains in the seat. this is going to be a very intresting thing to put on a car seat but i have one question though.if you are sick and you have to drive to the hospital the car wouldn't start up.whats going to happen.just sit there and die or something.because this doesn't make any since.to have a car not follow your rules i thought they were made to do whatever they are told but i guess not.one thing i know i would not buy this car what so ever. i think this is a really good idea, and should be introduced to england once they find out how to make them. Looking over the ocean from USA to this great invention, I am looking forward to seeing it on our market, too. To complete what Sara was saying, I think the smart seat is a safe device that does not allow you to drive yourself to the hospital anyway since you are unable to do it alone. Otherwise, the ill patient will become a public danger to others and that's why you have the emergency services available.